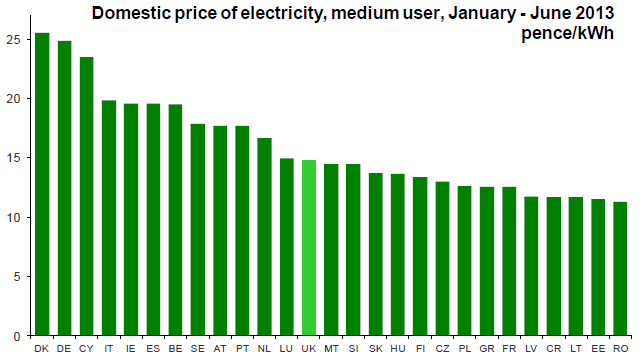 UK domestic energy prices are amongst the lowest in the developed world. Future gas supplies, prices and demand remain highly uncertain. Recent actions by Russia (a major supplier of gas into Europe) in Ukraine (a country on a major pipeline route) have reminded us of the impact of geopolitical factors outside our control on our energy supply. The politically convenient dash for shale gas is clumsy, short sighted and risk blind, locking the UK into a high cost, insecure and high emissions energy architecture. Even if the fuel is available, there needs to be sufficient investment in power stations to generate the required quantities of electricity. EMR is intended to encourage investment in low carbon energy infrastructure but is challenged by the differing investment perspectives of public and private investors. Many factors will continue to force energy prices upwards – but the UK is in a better position than most, and continued support for progressive decarbonisation will further improve our competitive position in the world. UK energy prices are amongst the lowest in the more economically developed nations. 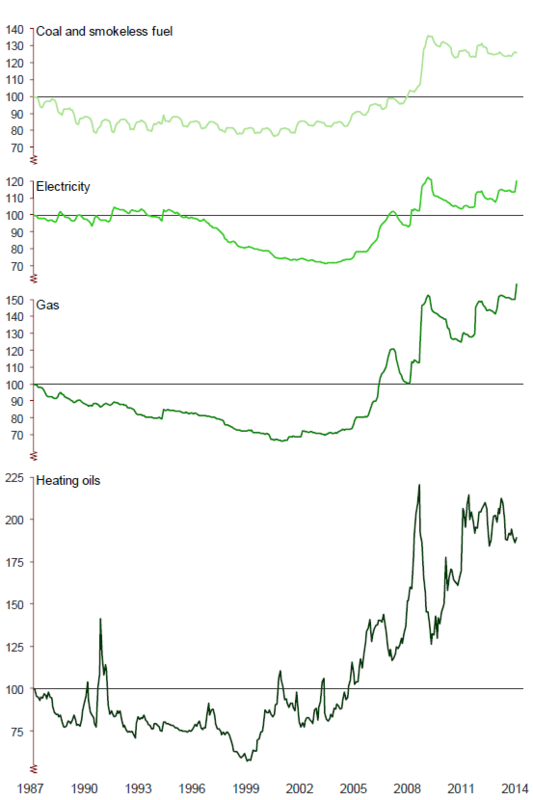 Difficult to believe perhaps in the context of the media onslaught against the energy companies, but historical prices for domestic gas and electricity in the UK have consistently been amongst the lowest for over 30 years (Figure 1 and Figure 2). So what is all the fuss about? Gas has been one of the most important fuels used to generate power and so one would expect some correlation between prices. Figure 3 illustrates this correlation and the significant rise in UK energy prices since 2004. The trend is similar across the world and is a response to increased demand from rapidly developing nations and increased cost of extracting oil and gas. Structural changes to energy markets, changes in policy regarding nuclear power, and decarbonisation also contribute to pressure on price. Affordability and Security – Could shale gas reduce UK energy prices? 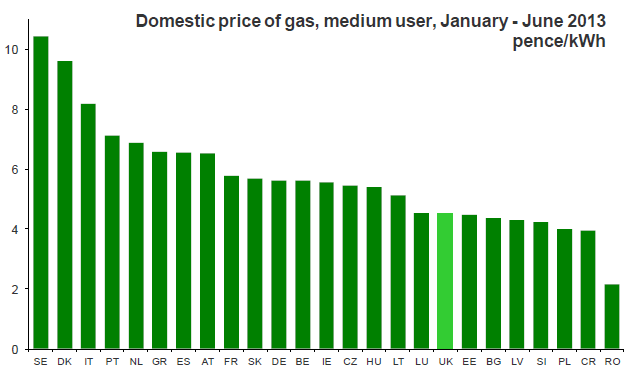 The UK gas market is highly interconnected with the rest of Europe, with limited price differences across the region as illustrated in Figure 4. No gas producers will hold their production for sale in the UK at a low price when it can be shipped by pipeline to Europe and achieve a higher price. 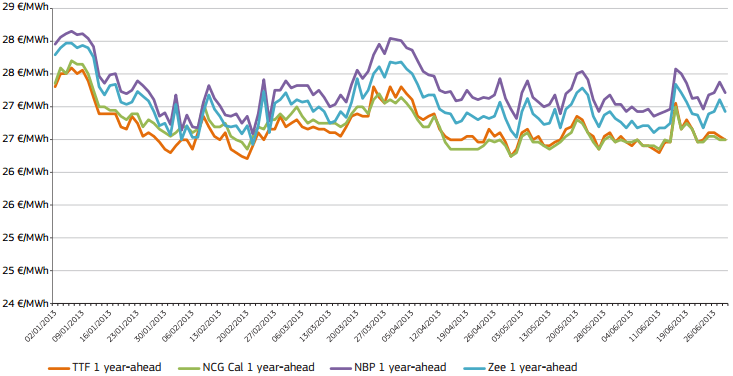 So the notion of reduced gas prices arising from UK shale gas alone is almost impossible. OFGEM and National Grid have recently warned about increased risk of power outages due to a tightening of electricity margins as investment in essential new energy infrastructure fails to keep pace with the phasing out of old power generation plants. National Grid are offering capacity payments to large businesses to reduce their power consumption during peak demand times so that the threat of supply outages can be managed. The UK requires between £10 – 20Bn of investment annually for each of the next 15 years to replace its ageing infrastructure and so maintain a stable flexible electricity supply. A combination of generation technologies has always been required to balance the energy trilemma, as has a combination of private and public funding. The balance point has changed and a new mix of technologies and funding is now needed. EMR has been designed to achieve this new balance point through a combination of; including the cost of carbon in the price of fuel, contract for difference feed-in tariffs for low carbon generation, emission density limits and capacity payments for fossil fuel plants to ensure that the intermittency of renewable generation does not adversely affect the grid. The UK has already reduced its CO2 emissions by over 25% on the 1990 baseline level and still enjoys some of the lowest prices for electricity and gas amongst the developed nations (Figures 1 & 2) as well as remaining competitive in the international marketplace. Looking forwards, most observers accept that UK energy prices will continue to rise with or without Electricity Market Reform (EMR), simply because the cost of generating low carbon power is greater than the cost of generating unabated high carbon power. DECC forecasts that EMR will help to limit these price rises and points to a reduction in household energy bills by around 11% between 2014 and 2030 in real terms when compared to a UK policy without EMR. Implicit in these forecasts is a reduction in energy consumption of 30% by 2030. As a result UK energy costs in 2030 may provide a competitive advantage in comparison to other nations thanks in part to EMR. In 2013 the UK produced 27% of its electricity from gas power stations and this figure is set to grow as units in the ageing coal fleet come out of service over the next 5 years. Gas is therefore extremely important to the UK at the present time. The thing about the Energy Trilemma is that there are three items to balance; affordability, security and emissions. Simply addressing domestic energy price may be a populist sound bite, but it not a viable energy policy in 2014. This sort of announcement contributes to perceptions of political risk for investors contemplating energy infrastructure investment in the UK. The mix of private and public money required to fund the ~£300Bn investment in energy infrastructure is further complicated by the differing and sometimes conflicting perspectives of those two classes of investor. Governmental investments typically consider a multi-generational time horizon, an assessment of the social impact over that time frame and an estimate of the costs associated with dealing with that change. Rates used in the discounting process are generally around 2%. Private investors consider a time horizon that is approximately the lifetime of the asset and will almost always be shorter than a governmental perspective. The analysis will include an assessment of all relevant costs and require a discounting rate at least as large as the investors cost of capital, typically 8 – 15%. These issues all contribute to deferral of energy investment decisions. It looks like UK energy prices will continue to rise, but the UK is well placed retain competitive energy prices going forward. Major gas price uncertainty remains against a rapidly changing supply and demand landscape. Whilst cheap shale gas flooding into the UK from domestic sources and US are possible, they are considered unlikely. Further investment in the US to halt declining production in some provinces there, already demands higher prices. Being linked to major continental European markets through gas and electricity interconnectors it will become increasingly difficult to preserve significant price difference between the UK and other European gas hubs. EMR is intended to rebalance the UK energy trilemma and encourage investment in low carbon energy infrastructure but is challenged by the differing investment perspectives of public and private investors. Gas is and will remain an important component in the UK energy supply to be used where it makes sense to effect a transition into a low carbon electricity system without locking in long term emissions. A new dash for gas now is clumsy, short sighted and risk blind, potentially locking the UK into a high cost, insecure and high emissions energy architecture creating further dependence on increasingly volatile international gas markets. The current balanced approach adopted within UK Energy Policy is heading in the right direction. Ultimately, it can all be undone by ineffective policy deployment or a policy shift driven by political weakness, short termism and a hope that world gas prices will fall and stay low over the next 20 to 30 years. How confident are you that a bet on UK shale gas and a benevolent Russian gas supply will assure future UK energy security? This article was written by Steve Murphy and Alan James.